In case you missed Wednesday night's episode of the Colbert Report, we thought we'd show you Stephen Colbert getting his head 3D printed by MakerBot Industries. Is that the geekiest thing you've ever seen on the Colbert Report or what? On a recent episode of the Colbert Report, Stephen Colbert got a chance to have his head 3D-printed. His guest on the show, Bre Pettis--who is a founder of 3D-printer manufacturer MakerBot--showed off some of the more interesting creations that can be made using their unique printer, along with some very interesting prints of Stephen (yes, you know you want one). In the episode we see that with some creativity even Stephen Colbert can be given wings and tentacles. And the best part? Now you can have your own Stephen with tentacles or you can make your own creation! In the video below, MakerBot's Thing-O-Matic is the 3D printer which you can see in the video below printing Stephen Colbert's head. Due to the high cost of traditional printers the team at MakerBot came up with a cheap 3D printer, the Thing-O-Matic, that almost anyone can own if you have a little spare cash; you can get one for only $1299.00--cheap compared to some of the more expensive commercial printers which can run into the hundreds of thousands of dollars, or even millions. The Thing-O-Matic is not just cheap, but it's also fairly accurate. According to Bre Petti the Thing-O-Matic theoretically has an accuracy in the microns, but due to the larger layering of the printer it's really more accurate to about 1/3 of a millimeter. While it might not be accurate anough for items that require a high degree of precison, it is good enough to make some pretty neat stuff. On the MakerBot community Thingiverse, you can view, download, and 3D-print other people's creations. You can even print the awesome Colbertopus (photo above) or the bizarre Lepus Colberus (The Colberabbit). 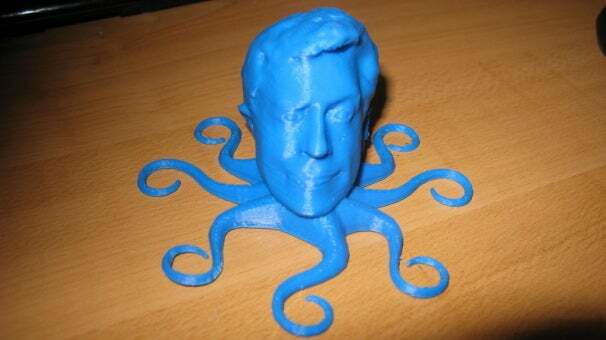 Be sure to heck out all the Colbert things on Thingiverse.